It's always nice when you run across something that makes you say "Well, I don't know if this needs to exist, but I'm glad someone took a shot at it." Case in point: a modder tried to re-create the first The Legend of Zelda game using the engine for the first Doom title. The project might never be finished, but we at least get some pretty cool screenshots out of the deal. The Legend of Zelda: Total Conversion kicked off a few years ago as a test demo. The project's leader "Exkodius" recently admitted Total Conversion might never see completion under their hand, so they released the project's files into the wild in hopes that another modder will finish this 3D quest. Unfortunately, there's no video of Exkodius' work so far, but there's a handful of screenshots to pore over. The Legend of Zelda and Doom are both old games (their release dates are 1986 and 1993 respectively), but their gameplay presentation couldn't be more different. One's a top-down adventure game that has the player rely primarily on melee attacks, and the other is a 3D shooter that revolves around long-distance projectile weapons. If a scientist executed a biological project equivalent to "stuffing Zelda into Doom," they'd be called in front of an ethics committee. Luckily, we can do crazy experiments with video games because they're just bits of data and totally not real. Right? 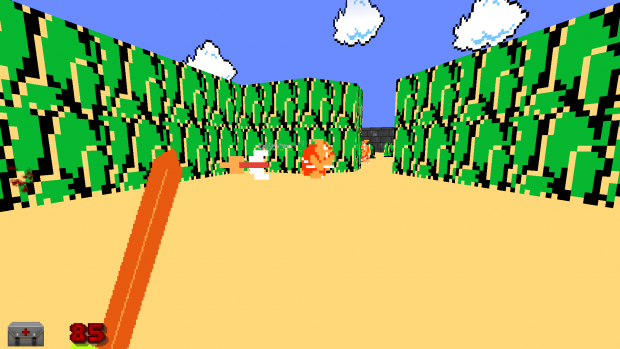 If you have what it takes to work on Exkodius' Zelda Doom mod, give it a shot. If you don't, it's not the end of the world. The Legend of Zelda is thriving in 3D, and Doom's not doing too badly for itself either. If you're just dying for that classic PC Doom feeling, though, sit tight. Doom co-creator John Romero is working on Sigil just for you. It's coming in February. Tagged with Action Adventure,	id Software,	John Romero,	NES,	News,	Nintendo,	PC,	Retro,	Shooters.